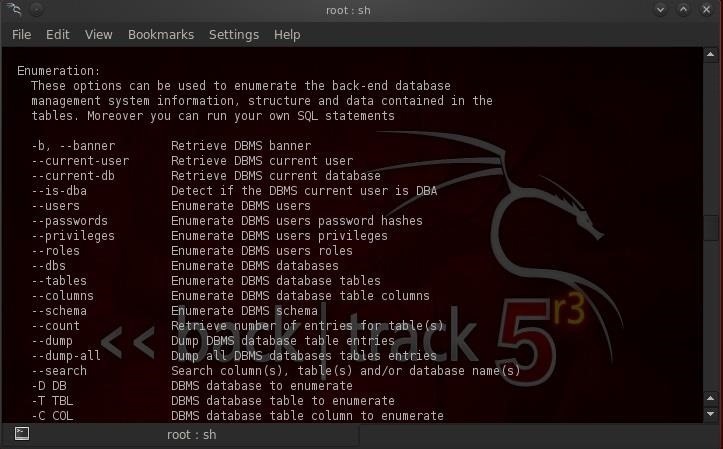 In a previous tutorial on hacking databases, I showed you how to find online databases and then how to enumerate the databases, tables, and columns. In this guide, we'll now exfiltrate, extract, remove—whatever term you prefer—the data from an online database. As MySQL, the open source database now owned by Oracle, is probably the most widely used back-end database of online websites, we'll use it as an example. Similar techniques can be used for Microsoft's SQL Server, Oracle, DB2, Postgresql, etc. 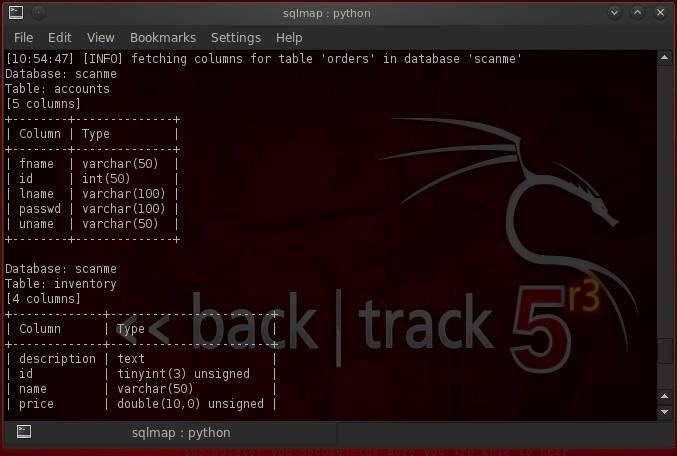 We will be using sqlmap, once again, which is a versatile and powerful tool for hacking databases. It has been used in a number of successful and highly publicized hacks by Anonymous members and other hackers against web-based databases. 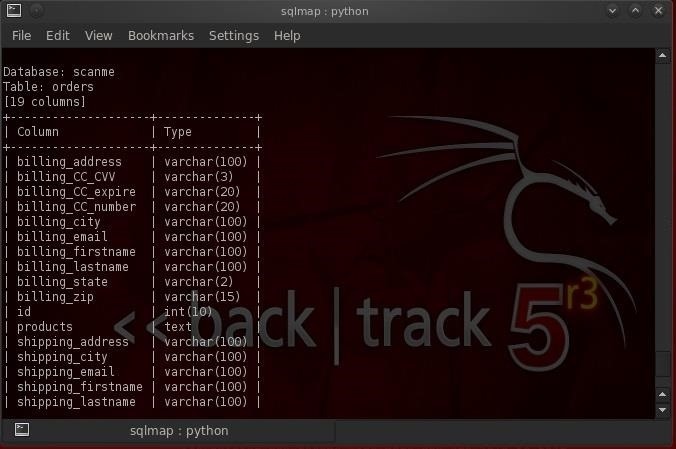 Any self-respecting (and for that matter, self-loathing) hacker should be familiar with sqlmap. As such, I want to spend a few tutorials showing you its power and capabilities. Here we will focus on exfiltration, but it can do so much more. In this tutorial, we'll work on how to extract the data after we've found the database and enumerated the database. Since the data in the database server is the hacker's "Golden Fleece," the ability to find and extract it is among the most critical skills for an effective hacker. If you need help finding sqlmap, refer back to my previous tutorial. As we can see, the capabilities and options for using sqlmap are numerous. In my previous tutorial, we had used a URL to target the database by using the -u switch (such as ./sqlmap.py -u "http://www.someURL.com), but notice that in the screenshot above we have the option to do a lot more. We can use a direct connect (-d), the logfile (-l), a bulkfile (-m), HTTP requests (-r), use googledorks (-g), or use a configuration .ini file (-c). For now, we will continue to use the URL option, or -u option, in our attack here, but we will explore the other attack options in future guides. If we scroll down the help screen a bit, we will see another section called "Enumeration." These are the options available to enumerate various objects in the target database. In our previous example, we had enumerated; first, the databases (-dbs); then, the tables (--tables); and finally, the columns (--columns). Notice, though, that we can also enumerate the users and password hashes, among many other database objects. Now, run this command to get a list of users. As you can see in the above screenshot, sqlmap told us that the DBMS is MySQL, the web application technology is PHP 5.3.3, the webserver is Apache, and finally, where I highlighted, it was able to enumerate one user 'scanme'@'%'. In MySQL syntax, this means that the user's name is "scanme" and they can login from (@) the following host or IP. In this case, the user "scanme" can login from any host or IP, as the database admin has used the wildcard "%" which means "any or none". If the database admin had used a IP address here, such as 'scanme@192.168.1.100', the user "scanme" would only be able to login from that IP address. In this case, scanme can login from any IP making it much easier for us to hack the database in the future using scanme's account, as it will allow scanme to login from any IP address. So, we can use scanme's credentials from any IP address and get into the database "legitimately". As I'm sure you remember from my earlier sqlmap tutorial , we were able to enumerate the databases, the tables, and the columns for the website http://webscantest.com, such as we see below. When we enumerated the columns on the order table, we could see that this table includes some VERY valuable information, most importantly the credit card numbers used for orders on that website. It is that info that we want to extract to our system. If you look back on my past MySQL guide, you will see that I showed you how to backup data from a MySQL database by using the sqldump command. This is one of the many ways a database admin can back-up there data in MySQL. What we will do here is essentially the same, but here we will use the sqlmap tool to produce nearly the same result. Of course, the location of the file is going to be dependent upon the name of the website, the database name, and the table name. Now that we have the credit card numbers, we have accomplished what Jason never could, we have the "Golden Fleece"! Stay tuned for more adventures in database hacking here on Null Byte for more guides soon to come. Interesting. Why would you want to add data? As an example, if we're talking about a black-hat hacker, he could insert data to forge information of a fake purchase, to then post complaint to the website not having delivered his product. The website would check and (forgive my language) BAM, the website admin sees there was indeed a purchase. The hacker gets the product for free, perfectly. Good Luck with that Horls! I was wondering, is there any way to ssh backtrack with a jailbroken iphone? How to ssh backtrack/kali master OTW? Do you mean wonderhow.com? If so, of course, there is data. Ple explain how to hack win7 using backtrack? I have question about enumeration with sqlmap .When enumerating a website database which IP address appears, real IP or the proxy IP address?? If you are running sqlmap through a proxy properly then the proxies IP address will appear to the sql server. please could a website ending with "index.php?option...id..." also be vulnerable to SQL injection? Yes. Try running a vulnerability scan on it. Look try to do a ' by the end of the link of the website and if it says error its vulnerable ?????? is it possible to spoof and extract data?? same as insert, I've tried to look for solution in the google for this problam, but no luck. If someone have knowledge please explain me a little bit how can I actually update data to hacked website database. Thanks .